(Nanowerk Spotlight) Graphene is a two-dimensional (2D) carbon material that displays a unique mix of properties: not only does it have the highest electrical and thermal conductivity among all materials known so far, but it also has been shown to be the thinnest, stiffest and strongest material, as well as being impermeable to all standard gases. One physical property that so far has been missing from this impressive list is magnetism. In its pristine state, graphene exhibits no signs of the conventional magnetism usually associated with such materials as iron or nickel. In previous reports, scientists already observed paramagnetism in graphene samples exfoliated from graphite crystals with a high density of edges and defects (see for instance: "Graphene reveals its magnetic personality") and ferromagnetism has been observed when organic molecules were deposited on a graphene-ruthenium substrate (see: "New magnetic graphene may revolutionize electronics"). Thus far, though, no reports that provide comprehensive evidence for either macro- or nanoscale magnetic phenomena for the ferromagnetism of carbon nanostructures in chemically functionalized graphene structures have appeared in the literature. Researchers have now filled this gap. The multi-disciplinary team, including Dr. Jeongmin Hong at UC Berkeley, Professor Sakhrat Khizroev’s group at Florida International University (FIU), Professor Robert Haddon at UC Riverside, and Professor Walt de Heer at Georgia Institute of Technology teamed up to demonstrate, for the first time, the presence of magnetic properties in graphene nanostructures at room temperature. Talk about a multi-institutional collaboration: The pristine graphene used in these experiments was epitaxially grown at Georgia Tech. Then, it was chemically functionalized at UC Riverside. The physics of magnetism was studied at FIU and UC Berkeley. "After working on this challenge since 2008, we have finally overcome it by using refined functionalization chemistry to induce interacting magnetic spins in 1D and 2D graphene nanostructures,"Jeongmin Hong, a Postdoc Fellow at UC Berkeley's Center for Energy Efficient Electronics Science, tells Nanowerk. "It is the first ever experimental evidence of magnetism in graphene-based nanostructures." 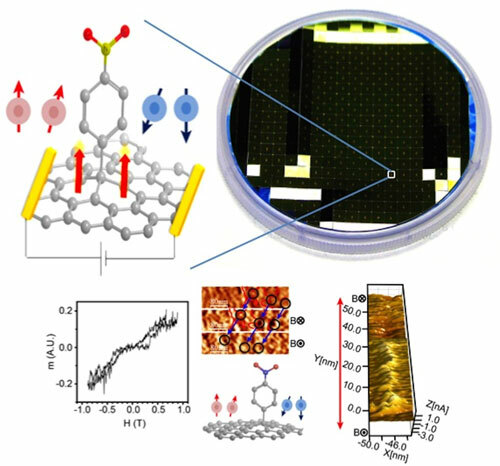 Hong is first author of a paper in the October 25, 2013 online edition of ACS Nano ("Chemically Engineered Graphene-Based 2D Organic Molecular Magnet"), where the team demonstrated that nitrophenyl functionalized graphene can act as a room-temperature 2D magnet. The main objective of this study was to reconfirm the presence of magnetic order in nanoparticle-functionalized graphene nanostructures through a new set of experimental data and attempt to correlate the new findings with previously reported results. In particular, as Hong points out, the researchers presented five new findings to shed light on the origin of magnetism in graphene: "1) the field dynamics of microscale graphene acquired through AF-MFM measurements; 2) magneto-optical Kerr effect (MOKE) measurements indicating magnetic ordering along the primary graphene directions; 3) the presence of chemically isolated nanoribbons observed by macroscale measurements with a 30° rotation and microscale (through STM) measurements; 4) Giant magnetoresistance effects supporting antiferromagnetic ordering; and 5) Anisotropic magnetoresistance effects reflecting the 2D nature of nanostructures in a mesoscopic system." The range of potential applications for magnetic graphene is very broad, from information processing to medicine. The most important application in the near future most likely is in the emerging field ofspintronics (where a signal is processed using magnetic spin properties rather than electric charge). "The new functionalized graphene nanostructures pave a way to an unprecedented control of both electron band gap and spin properties, which is the key to enabling spintronic devices for energy-efficient extremely-fast information processing," explains Hong. He also notes that it is very difficult to generate magnetism – using functionalization – on adequately large surfaces. "An important challenge is to provide sufficient uniformity of the functionalization process to control ordered spin states. We are working on this problem. Our main platform is epitaxially grown graphene, which has a great potential for solving this challenge." "Still, there is lots of basic science to understand," he continues. "We are definitely closer to the next stage, which is applications. We would like to team up with other groups across the globe who could help us realize the great potential of this new material." The project is supported through National Science Foundation (NSF) Materials Research Science and Engineering Center (MRSEC) “Graphene-based Nanoelectronics” at Georgia Tech. This work is a continuation of the original research by the same team from a few years ago published in Scientific Reports ("Room-temperature Magnetic Ordering in Functionalized Graphene").